Summer is a difficult time for your garden. A lot of the most popular plant choices just weren’t designed for the Australian climate, let along the baking summer sun. With plenty of water and care, you can get introduced species to thrive all year long, but if you’re tired of all that maintenance, or you just want an easier option, you should consider going native. Native species have evolved to cope with the heat, lack of water and poor soil quality that characterises much of the Australian continent. That means that gardens full of native species won’t need to be mulched and fertilised as often and they won’t need to be watered as much. This cuts your maintenance time in half, while also saving you from wasting money on plants that are impossible to keep alive. The best part about native species is you don’t have to sacrifice on beauty and colour. Native species go far beyond spinifex and grass trees. Native species are full of vibrant colours and beautiful textures, which allow you to create a stunning and low-maintenance garden. Spotted Emu Bush: This plant is perfect for areas with poor soil quality and hopeless gardeners. It is incredibly low maintenance and doesn’t need much water. All you have to do is place it in the sun and watch it thrive. It is also a particularly beautiful shrub, producing red-purple flowers in all seasons and all climates, except Darwin and the east coast of Queensland. Kangaroo Paw: This is perhaps the most common native pant choice for the garden, and for a good reason. If it gets enough sun and is placed in well-drained soil, you’ll be rewarded with rich red, yellow flowers from late winter until summer. It works perfectly as a potted plant, and in garden beds, because it doesn’t get too large. It grows best in temperate climates. Waratah: Unlike other native species, this iconic plant can be a little tricky to grow. You need to be particularly careful of wind, so choose a protected part of your garden. If you get it right, the tight and textured red flowers are just beautiful. Happy Wanderer: If you want a creeper that is easy to maintain, go for the happy wanderer. It’s the perfect way to decorate any vertical sections of your garden and produces beautiful, lilac coloured flowers through spring and winter. NSW Christmas Bush: This bush will work in any Australian garden, despite its name. It grows up to four metres tall, meaning it can be a real centrepiece of your backyard. If you plant it in a sunny spot, in well-drained soil, you’ll get flowers right through the summer and Christmas period. 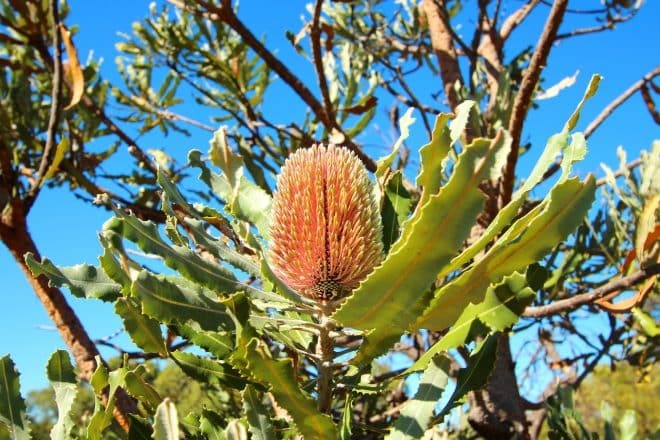 Banksia: Perfectly suited to the temperate coastal region of Australia, this plant’s distinctive cone-shaped flowers make it a popular choice. It is easy to grow and maintain, and the flowers are most likely to blossom throughout winter. Wild Fuchsia: This plant produces beautiful, fuchsia-like flowers ranging from red-yellow to pink. They can grow up to two –metres high and are an excellent option for anyone living in a coastal region. Hibiscus: Hibiscuses are easy to grow, and are best suited to garden beds. They flower all year around in a variety of colours, and attract local birdlife, meaning your garden will be humming with life. Giant Lilies: The Giant Spear Lily and the Gymea Lily is easy to grow, and produce beautiful, red sword-like leaves that grow to a metre long. They also deliver bright red flowers, although flowering doesn’t occur until the plant is six-ten years old. This is just a sample of the types of plants and flowers our beautiful continent has to offer. Plant any of these in conjunction with native plants and shrubs, and you’ll have a beautiful garden all year long that requires little maintenance and will save you on your water bill. If you love roses, gardenias and other European varieties, don’t think you have to tear them all out and go all native. Native varieties can be a fantastic way to complement your labour-intensive species, and add some native colour and texture to your garden. You should contact a professional landscaper before you begin the process of buying and planting native species. A professional will be able to survey your existing garden, test your soil and make recommendations on the types of plants that will thrive in your area.